From Paramount . Producer : Lucien Hubbard. The story of two World War I aviators who are both in love with the same woman. WINGS was the only silent film to win Best Picture, as it was also one of the last films of the silent era. The epic starred Charles 'Buddy' Rogers, Richard Arlen, and Clara Bow. The film was only nominated for 2 total Oscars, and won only one. Directed by William A. Wellman. From MGM . Producer : Harry Rapf. The story of two sisters who work in vaudeville, and their story of their love for a successful man on Broadway. It contained a big musical number shot in color, and was the first sound film to win Best Picture. 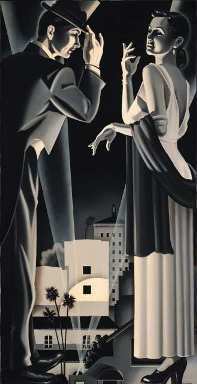 The success of the film spawned three more films in the Broadway Melody series. The film was nominated for 3 total Oscars, and won only one. Starred Bessie Love, Charles King, and Anita Page. Directed by Harry Beaumont. From Universal . Producer : Carl Laemmle, Jr. Adapted from the stunning anti-war novel by Erich Maria Remarque, this landmark film told the story of seven German schoolboys in 1914 as they face the true horror of World War I. It was a very daring film for its time, and marked the real beginning of the anti-war film genre. The film was nominated for 4 total Oscars, and won two, marking the first time that the film's director was also honored with Best Director along with the Best Picture win. Starred Lew Ayres, Louis Wolheim. Directed by Lewis Milestone. Based on Edna Ferber's epic novel, this is one of the few Westerns to ever win Best Picture. It told the story of homesteaders in the great Oklahoma land rush of 1888. The film was nominated for 7 total Oscars, and won three. Starred Richard Dix, Irene Dunne. Directed by Wesley Ruggles. The story of several different characters during a 48 hour period in a hotel in Berlin. This was one of the first "all-star" movie events, bringing together several popular and respected actors of the time. The film was nominated for only one award, holding the honor of being the only film to win Best Picture without having any other nominations in any other categories. Starred Greta Garbo, John Barrymore, Joan Crawford, Wallace Beery, and Lionel Barrymore. Directed by Edmund Goulding. The story of an unmarried couple, and the effect of world events on their lives between New Year's Eve of 1899 and the same night 33 years later. The film was nominated for 4 total Oscars, and won 3. Starred Diana Wynyard, Clive Brook. Directed by Frank Lloyd. A comedy of a man and woman falling in love. The film was a huge success, and became at that time one of the most honored films in the Academy's history. It was nominated for 5 total Oscars, and won all 5. Starred Clark Gable, Claudette Colbert. Directed by Frank Capra. The true story of a mutiny aboard a British ship in 1789. The film was nominated for 8 total Oscars, and won only one, and was also distinguished by having three of its actors all contending for Best Actor, and neither of the three won. Starred Clark Gable, Charles Laughton, Franchot Tone. Directed by Frank Lloyd. The true story of the incredible Broadway showman, Florenz Ziegfeld. The film was nominated for 7 total Oscars, and won 3. Starred Luise Rainer, William Powell, Myrna Loy. Directed by Robert Z. Leonard. The true story of the early life of French novelist Emile Zola, as well as Zola's battles in the famous Dreyfus case. The film was nominated for 10 total Oscars, and won 3. Starred Paul Muni, Gale Sondergaard, Donald Crisp, Joseph Schildkraut. Directed by William Dieterle. A zany comedy about the Vanderhof clan. The film was nominated for 7 total Oscars, and won 2. Starred James Stewart, Jean Arthur, Lionel Barrymore, Ann Miller. Directed by Frank Capra. The epic film adaptation of Margaret Mitchell's story of a Southern belle and the epic struggles of the Civil War. The film became one of the most popular films of all time. It was also the first all-color film to win Best Picture. It was nominated for 13 total Oscars, and won 8, setting new records at the Oscars at the time with those totals. Starred Clark Gable, Vivien Leigh, Hattie McDaniel, and Olivia De Havilland. Directed by Victor Fleming. A mysterious story from director Alfred Hitchcock of a married woman's realization that she may never escape the mysterious presence of her husband's first wife, who had died mysteriously. It was nominated for 11 total Oscars, and won 2. Starred Laurence Olivier and Joan Fontaine. Directed by Alfred Hitchcock. An older man reflects back on his childhood, looking back at the struggles of his miner family. It was nominated for 10 total Oscars, and won 5. Starred Walter Pidgeon, Maureen O'Hara, Donald Crisp, Roddy McDowall. Directed by John Ford. It was a perfect film for its time, telling the story of an English family, and their struggles during wartime. It was nominated for 12 total Oscars, and won 6. Starred Greer Garson, Walter Pidgeon, Teresa Wright, and Richard Ney. Directed by William Wyler. The immortal classic, telling the story of Rick and Ilsa, and their reunion amidst World War II. It has since become one of the most treasured romantic classics of the golden age of cinema, with some of the most famous lines of dialogue. It was nominated for 8 total Oscars, and won 3. Starred Humphrey Bogart, Ingrid Bergman, Paul Henreid. Directed by Michael Curtiz. The inspiring story of a young priest on his first assignment in a New York parrish. It was a very popular and warm film for war-weary audiences, and inspired a sequel. The film was nominated for 10 total Oscars, and won 7. Starred Bing Crosby and Barry Fitzgerald. Directed by Leo McCarey. An unconventional choice, the story was an in-depth examination of an alcoholic during a harrowing weekend in New York City. The film was nominated for 7 total Oscars, and won 4. Starred Ray Milland. Directed by Billy Wilder. An overwhelming classic, it is the powerful story of three World War II veterans trying to re-adjust to civilian life after the war. It was nominated for 8 total Oscars, and won 7. Starred Fredric March, Harold Russell, Dana Andrews, and Myrna Loy. Directed by William Wyler. The story of a writer who poses as a Jew to write an article on anti-Semitism. It was a powerful film showing the plague of racism in the United States. It was nominated for 8 total Oscars, and won 3. Starred Gregory Peck, Celeste Holm, Dorothy McGuire. Directed by Elia Kazan. The only film adapted from one of William Shakespeare's plays to win Best Picture, this is the immortal classic story of Hamlet. It was nominated for 7 total Oscars, and won 4. Starred Laurence Olivier, Jean Simmons, and Terence Morgan. Directed by Laurence Olivier. Based on the Pulitzer Prize winning novel, it's the story of a corrupt politician, loosely based on Louisiana's Huey Long. It was nominated for 7 total Oscars, and won 3. Starred Broderick Crawford, Mercedes McCambridge, and Joanne Dru. Directed by Robert Rossen. A complex story looking at the New York theatre scene, telling the stories of an older Broadway actress, a playwright, a young director, as they are all affected by an ambitious young actress. It was nominated for a record setting 14 total Oscars, and won 6. Starred Bette Davis, Marilyn Monroe, Anne Baxter, Celeste Holm, Hugh Marlowe, Thelma Ritter, and George Sanders. Directed by Joseph L. Mankiewicz. A classic Gershwin musical, it was only the third musical at that time to win Oscar's top prize, and was considered a surprise win that year. It was nominated for 8 total Oscars, and won 6. Starred Gene Kelly, Leslie Caron, Nina Foch, and Georges Guetary. Directed by Vincente Minelli. A master spectacle from the master showman himself, Cecil B. Demille, this film was a great drama set against the backdrop of the Ringling Bros-Barnum & Bailey Circus. It was nominated for 5 total Oscars, and won 2. Starred James Stewart, Charlton Heston, Betty Hutton, Dorothy Lamour, and Cornel Wilde. Directed by Cecil B. Demille. Based on the novel by James Jones, this was the popular film about Army life at the Scofield Barracks in Hawaii just before the 1941 attack by the Japanese on Pearl Harbor. It was nominated for 13 total Oscars, and won 8, tying the record at that time. Starred Burt Lancaster, Deborah Kerr, Montgomery Clift, and Frank Sinatra. Directed by Fred Zinnemann. The story of corruption and brutality on the New York-New Jersey shipping docks, following the story of one normal longshoreman named Terry Malloy, who endures a moral struggle after realizing he is working for a corrupt boss. It was nominated for 12 total Oscars, and won 8. Starred Marlon Brando, Eva Marie Saint, Lee J. Cobb, Rod Steiger, and Karl Malden. Directed by Elia Kazan. The only film to win Best Picture which had been adapted from a television drama, this poignant film told the simple story of a Brooklyn butcher and the woman he falls in love with. It was nominated for 7 total Oscars, and won 4. Starred Ernest Borgnine, Betsy Blair, and Joe Mantell. Directed by Delbert Mann. The fantastical story of a British man in 1872, setting out to win a bet that he can circle the entire globe in 80 days. The film featured several cameo appearances by popular stars at the time. It was nominated for 8 total Oscars, and won 5. Starred David Niven, Robert Newton, Cantinflas, and Shirley Maclaine. Directed by Michael Anderson. Based on Pierre Boulle's novel, recognized as one of the great anti-war movies, detailing the madness of war through the eyes of a Colonel who helps the enemy in building a bridge, and ultimately is responsible for its destruction. It was nominated for 8 total Oscars, and won 7. Starred Alec Guinness, William Holden, Jack Hawkins, Sessue Hayakawa, and Geoffrey Horne. Directed by David Lean. Taking place in 1900 in Paris, this popular musical told the story of a teenage girl trained by a rich aunt to be part of the family tradition, and follows her as she turns the whole plan upside down by deciding to put marriage first. It was nominated for 9 total Oscars, and won all 9, setting a record for the most wins for a single film at the time. Starred Hermione Gingold, Louis Jourdan, Leslie Caron, Maurice Chevalier, and Eva Gabor. Directed by Vincente Minnelli. The epic spectacle telling the story of Judah Ben-Hur, a wealthy Jew sentenced to be a slave, it was a remake of the 1926 silent version, and became a critical and commercial success. The film's exciting chariot race sequence is one of the most popular and rousing sequences in film history. It was nominated for 12 total Oscars, and won 11. The 11 Oscars awarded to the film set a record that would remain unmatched for 37 years. Starred Charlton Heston, Stephen Boyd, and Hugh Griffith. Directed by William Wyler. The story of a struggling insurance clerk who rents out his apartment in Manhattan to co-workers for their extra-curricular activities in exchange for promotions, was a small and interesting tragi-comedy. It was nominated for 10 total Oscars, and won 5. Starred Jack Lemmon, Shirley Maclaine, and Jack Kruschen. Directed by Billy Wilder. Essentially the Romeo and Juliet story but in a musical setting, it was a film adaptation of the successful Broadway play. It was nominated for 11 total Oscars, and won a near record 10. Starred Natalie Wood, Richard Beymer, George Chakiris, and Rita Moreno. Directed by Robert Wise and Jerome Robbins. The visually stunning epic telling the story of the desert campaigns of Thomas Edward Lawrence during World War I, where he led Arab raids against the Turks. The musical score and astounding cinematography are the most memorable elements of this true epic. It was nominated for 10 total Oscars, and won 7. Starred Peter O'Toole, Alec Guinness, Anthony Quinn, Jose Ferrer, Omar Sharif, Claude Rains. Directed by David Lean. One of the more interesting choices for Best Picture, this was the bawdy tale of a young man raised as an English squire, who ends up losing everything. It was one of the few British made films to ever win Best Picture. It was nominated for 10 total Oscars, and won 4. Starred Albert Finney, Hugh Griffith, Dame Edith Evans. Directed by Tony Richardson. The musical version of George Bernard Shaw's play Pygmalion became an instant classic when it came to the screen. Telling the story of Eliza Doolittle and her transformation under the training of an English professor, it still remains one of the most popular and cherished musicals of all time. It was nominated for 12 total Oscars, and won 8. Starred Audrey Hepburn, Rex Harrison, Stanley Holloway, Gladys Cooper. Directed by George Cukor. One of the most well known and loved musicals of all time, this film was an adaptation of the stage musical, and told the true life story of Maria Trapp, and her travails in Austria. It was nominated for 10 total Oscars, and won 5. Starred Julie Andrews, Christopher Plummer, Eleanor Parker, Peggy Wood, Anna Lee. Directed by Robert Wise. Adapted from the stage play, it told the story of the last seven years in Sir Thomas More's life ... he was the respected 16th-century English chancellor who eventually was beheaded by King Henry VIII. It was nominated for 8 total Oscars, and won 6. Starred Paul Scofield, Robert Shaw, Wendy Hiller. Directed by Fred Zinnemann. THE OTHER FILMS NOMINATED : Alfie, The Russians Are Coming The Russians Are Coming, The Sand Pebbles, Who's Afraid of Virginia Woolf? The first film in the detective genre to win Oscar's top prize, it told the story of a black detective (They call me Mr. Tibbs! ), who comes into a small Mississippi town to solve a murder. It was nominated for 7 total Oscars, and won 5. Starred Sidney Poitier, Rod Steiger. Directed by Norman Jewison. This was a musical version of the popular Charles Dickens story, Oliver Twist. It was nominated for 11 total Oscars, and won 5, plus a special award for its choreography. Starred Ron Moody, Oliver Reed, Shani Wallis, Hugh Griffith, Jack Wild, Mark Lester. Directed by Carol Reed. A harrowing portrait of the underbelly of humanity, telling the story of two lost souls trying to survive together. Even though it was later reclassified with an R rating, it remains the only X-rated film to ever win Best Picture. It was nominated for 7 total Oscars, and won 3. Starred Dustin Hoffman, Jon Voight. Directed by John Schlesinger. The film which told the true story of General Patton, and his command during World War II. It was nominated for 10 total Oscars, and won 7. Starred George C. Scott, Karl Malden, Steven Young. Directed by Franklin J. Schaffner. Adapted from the book, this was the nail biting action thriller telling the story of detective Jimmy "Popeye" Doyle, and his pursuit of drug runners. It was a gritty action film, not the usual type honored as Best Picture. It was nominated for 8 total Oscars, and won 5. Starred Gene Hackman, Roy Scheider. Directed by William Friedkin. Based on Mario Puzo's best selling novel, "The Godfather" was the epic story of the Mafia crime family, the Corleones. Don Vito Corleone is aging, and will soon need a successor. His only hope for making the family legitimate is Michael, and through uncontrollable circumstances, Michael becomes the new Don and succumbs to the world of mob violence. The film was nominated for 10 total Oscars, and won 3. Starred Marlon Brando, Al Pacino, James Caan, Robert Duvall, Talia Shire, Diane Keaton. Directed by Francis Ford Coppola. A lighthearted, enjoyable film taking place during the Depression. Two con men attempt to seek revenge on a racketeer by setting him up in a fake off-track horse betting ploy. It was nominated for 10 total Oscars, and won 7. Starred Robert Redford, Paul Newman, Robert Shaw. Directed by George Roy Hill. The continuation of the Corleone family story, this time the film went backwards in time to simultaneously show Vito Corleone's roots and rise to power, alongside the ascent of son Michael as the new Don of the Mafia family, and his further descent into hell. The epic film became the first sequel ever to win the Best Picture Oscar -- it was nominated for 11 total Oscars, and won 6. Starred Al Pacino, Robert Duvall, Talia Shire, Robert De Niro, Diane Keaton. Directed by Francis Ford Coppola. Based on Ken Kesey's novel, it's the story of Randle McMurphy, a man who enters an insane asylum and creates havoc and hope among the inmates, and squares off with the wicked Nurse Ratched. The film was nominated for 9 total Oscars, and won 5, the "Big Five", a rare feat, winning Picture, Actor, Actress, Director, and Screenplay. Starred Jack Nicholson, Louise Fletcher, Brad Dourif, Danny DeVito, Christopher Lloyd. Directed by Milos Forman. The story of a down on his luck prize fighter who gets the opportunity of a lifetime when the world's heavyweight boxing champion, Apollo Creed, offers Rocky Balboa a chance to fight him as a promotional match. A very personal film, detailing the struggle of a man searching for a purpose to his life, the film was enormously successful and spawned four sequels, all huge hits at the boxoffice. The film was nominated for 10 total Oscars, and won 3. Starred Sylvester Stallone, Talia Shire, Burt Young, Burgess Meredith, Carl Weathers. Directed by John G. Avildsen. From the comic genius Woody Allen, came one of his best films on modern romance, this time with the hilarious Annie, an aspiring singer, and Alvy, a nightclub comedian. It remains one of the very few comedies to ever win Oscar's top prize. The film was nominated for 5 total Oscars, and won 4. Starred Woody Allen, Diane Keaton. Directed by Woody Allen. The hard hitting story of three close friends from a rural Pennsylvania steel mill town, who are all drafted into the Vietnam War. The film follows the tragedy of what happens to all of them. The film was nominated for 9 total Oscars, and won 5. Starred Robert De Niro, Christopher Walken, John Savage, John Cazale, Meryl Streep. Directed by Michael Cimino. The touching story of the divorce of the Kramers, and the father's attempt to raise and keep his son. The film was nominated for 9 total Oscars and won 5. Starred Dustin Hoffman, Meryl Streep, Justin Henry, Jane Alexander. Directed by Robert Benton. The touching story of a family coping with the drowning death of one of the parents's sons. It was nominated for 6 total Oscars, and won 4. Starred Timothy Hutton, Donald Sutherland, Mary Tyler Moore, Judd Hirsch, Elizabeth McGovern, Adam Baldwin. Directed by Robert Redford. One of the most surprising dark horse winners in Academy history, it was the inspiring story of two athletes competing at the 1924 Paris Olympics. It was one of the few British made films to ever win Oscar's top honor. It was nominated for 7 total Oscars, and won 4. Starred Ben Cross, Ian Carmichael, Ian Holm, John Geilgud. Directed by Hugh Hudson. The epic true story of the peace activist, Mahatma Gandhi, following the full course of his life, up to his assassination. The film was nominated for 11 total Oscars and won 8. Starred Ben Kingsley, John Geilgud, John Mills, Trevor Howard, Martin Sheen, Candice Bergen. Directed by Richard Attenborough. The touching story of the difficult relationship between a mother and daughter, and what happens when the daughter becomes sick. It was nominated for 11 total Oscars and won 5. Starred Debra Winger, Shirley MacLaine, Jack Nicholson, John Lithgow. Directed by James L. Brooks. Based on the stage play, it was the fictional telling of the story of Wolfgang Amadeus Mozart, and the rivalry between him and the composer of the Vienna court, Salieri. It was nominated for 11 total Oscars, and won 8. Starred F. Murray Abraham, Tom Hulce. Directed by Milos Forman. The true story of author Karen Blixen, and her two relationships. The film is mostly known though for its beautiful African visuals and stirring musical score by John Barry. The film was nominated for 11 total Oscars, and won 7. Starred Robert Redford, Meryl Streep, Klaus Maria Brandauer. Directed by Sydney Pollack. Oliver Stone's hard hitting epic which revealed the true horror of the Vietnam War for the first time. Through its complex story of a war within an American platoon, "Platoon" conveyed the chaos of the conflict in a way not seen before this film. The film was nominated for 8 total Oscars and won 4. Starred Charlie Sheen, Tom Berenger, Willem Dafoe. Directed by Oliver Stone. The epic and moving true story of Pu Yi, who became Emperor of China at the age of three. The film was nominated for 9 total Oscars, and won all 9 of them, a rare feat for a film to win every award it was nominated for. Starred John Lone, Joan Chen, Peter O'Toole. Directed by Bernardo Bertolucci. The touching story of Charlie and Raymond Babbitt ... Charlie begins as a self-centered man unaware he has a brother, and begins by kidnapping his autistic brother Raymond to obtain his inheritance, but during their journey on the road together, Charlie rediscovers himself and forms a very special relationship with his brother. The film was nominated for 8 total Oscars and won 4. Starred Dustin Hoffman, Tom Cruise, Valerie Golino. Directed by Barry Levinson. The gentle story of a contrary Southern lady whose fading eyesight forces her son to hire her a driver. From their bitter beginnings, the driver and Miss Daisy form a very strong friendship, showing that a Jewish white woman and a black man could be incredible friends during such racial strife in the South. The film was nominated for 9 total Oscars, and won 5. Starred Jessica Tandy, Morgan Freeman, Dan Aykroyd. Directed by Bruce Beresford. The revisionist epic Western telling the story of John Dunbar, a Civil War soldier whose assignment at an abandoned fort leads him to the Sioux Indians, where he eventually joins their tribe, and fights the white men coming to take the Indian lands. The film was nominated for 12 total Oscars, and won 7. Starred Kevin Costner, Graham Greene, Mary McDonnell. Directed by Kevin Costner. The haunting story of an imprisoned serial killer, Hannibal "The Cannibal" Lecter, who assists a young female FBI agent, Clarice Starling, in tracking down a new murderer. The film was nominated for 7 total Oscars, and won 5, becoming one of the few films ever to win the "5 Majors" -- Picture, Actor, Actress, Director, and Screenplay, only matched by "One Flew Over The Cuckoo's Nest" and "It Happened One Night." Starred Anthony Hopkins, Jodie Foster, Scott Glenn. Directed by Jonathan Demme. A new take on the revisionist Western as a man known for his record of killing all his life, is called back to kill one more time when some local women are attacked. His final rampage comes when his best friend is killed. The film was nominated for 9 total Oscars, and won 4. Starred Clint Eastwood, Morgan Freeman, Richard Harris, Gene Hackman. Directed by Clint Eastwood. The true story of Oskar Schindler, a German who helped save the lives of more than 1100 Jews during the Holocaust. The film was a powerful testament to the horrors of the Holocaust, shot in black and white, and was a radical departure from the usual popcorn entertainment Spielberg previously directed. The film was nominated for 12 total Oscars, and won 7. Starred Liam Neeson, Ben Kingsley, Ralph Fiennes, Embeth Davidtz. Directed by Steven Spielberg. The fictional story of one less-than-intelligent man, whose incidental journeys through life take him through the biggest and most turbulent events from the 50's to the 80's, all in his own private search for the love of his life. The film was nominated for 13 total Oscars, and won 6. Starred Tom Hanks, Gary Sinise, Robin Wright, Sally Field. Directed by Robert Zemeckis. The true story of William Wallace, the man who led the fight for Scotland's freedom against the English in the 13th century. The film was nominated for 10 total Oscars, and won 5. Starred Mel Gibson, Sophie Marceau, Patrick McGoohan. Directed by Mel Gibson. Based on the popular and complex novel, this film told the story of a wounded man attempting to re-tell his story, the story of an illicit love affair set against the backdrop of World War II. The film was nominated for 12 total Oscars, and won 9. Starred Ralph Fiennes, Kristin Scott Thomas, Juliette Binoche, Willem Dafoe. Directed by Anthony Minghella. A fictional love story set amidst the real life 1912 disaster of the sinking of the Titanic. The film was nominated for 14 total Oscars, tying the all time record, and won 11, also tying the all-time record. The film also broke worldwide and domestic box office records, becoming the first film ever to make over $1 billion in total worldwide receipts. Starred Leonardo DiCaprio, Kate Winslet, Gloria Stuart. Directed by James Cameron. One of the first comedies to win Best Picture since Annie Hall in 1977, it told the 16th century story of the author William Shakespeare, and his romance with a woman that inspired him to write Romeo and Juliet. The film was nominated for 13 total Oscars, and won 7. Starred Joseph Fiennes, Gwyneth Paltrow, Geoffrey Rush, Dame Judi Dench, Ben Affleck. Directed by John Madden. One of the most adult, dark, and stunningly original films ever to claim Oscar's top prize. Unsettling and provocative, it is a portrait of suburbia as dark as it is illuminating. It tells the story of Lester Burnham, a man experiencing a mid-life crisis, and along the way, the film explores the hidden truths and painful revelations of the human experience, an epic on a human scale. The film was nominated for 8 total Oscars, and won 5. Starred Kevin Spacey, Annette Bening, Thora Birch, Mena Suvari, Chris Cooper, Wes Bentley. Directed by Sam Mendes. A throwback to the rousing sword-and-sandals epics of the past, this updated blockbuster told the story of a Roman general who must fight his way up from the depths of slavery to avenge the death of his wife and child. It was a rousing and visually exciting update of a genre once thought dead, and was the kind of epic spectacle that is tailor made for the Academy's tastes. The film was nominated for 12 total Oscars, and won 5. Starred Russell Crowe, Joaquin Phoenix, Connie Nielsen, Oliver Reed, Richard Harris. Directed by Ridley Scott. The epic human drama telling the inspirational true story of John Forbes Nash, Jr., a mathematician who suffered from schizophrenia, who ultimately went on to win the Nobel Prize for his revolutionary game theory. It was a powerful and unique perspective into the world of mental illness, as the audience experienced the confusion of schizophrenia along with the Nash of the film. It was an amazing film to see how a man who suffered from a disease of the brain could still maintain a mind of genius. The film was nominated for 8 total Oscars, and won 4. Starred Russell Crowe, Jennifer Connelly, Ed Harris, Christopher Plummer. Directed by Ron Howard. Just when we thought the musical as a genre was dead and buried, this adaptation of the Broadway musical took Hollywood by storm, and became the first musical to win the film industry's top honor since 1968. It brought audiences in droves, and perhaps started a new revival for the musical film genre. It was a film filled with an energy and excitement that made it simply fun to be a part of. The actors all sung and danced their own numbers, in this hilarious story of two murdering, fame-seeking women and the lawyer in their lives, as they "razzle-dazzle" the city through their manipulation of the media to achieve fame and escape capital punishment. From one powerhouse musical number to the next, it's a simple delight. The film was nominated for 13 total Oscars, and won 6. Starred Richard Gere, Renee Zellweger, Catherine Zeta-Jones, Queen Latifah, John C. Reilly. Directed by Rob Marshall. An epic achievement destined to quickly become a classic in the history of cinema, New Line Cinema and Peter Jackson took a huge risk, filming three movies all at once adapting the complex series of novels written by J.R.R. Tolkien. Released one December after the other, the previous two films failed to win any major Oscars, but the third and final film in the trilogy took the award home in a big way. In the epic conclusion, Frodo completes his quest to destroy the One Ring of Evil, as all the journeys end in one of the most visually amazing adventure/fantasy films ever made. It became the first fantasy film to ever win the Best Picture Oscar, as well as the first sequel to win the top honor without its previous films winning. Peter Jackson was able to bring the wonderfully detailed portrait of Tolkien's Middle Earth to the big screen thanks to so many great advances in visual effects, and the achievement will be enjoyed again decades from now. The film was nominated for 11 total Oscars, and won all 11, becoming one of the few films ever to completely sweep all the Oscars for which it was nominated, and tied TITANIC and BEN-HUR for winning the most Oscars ever. It also became only the second film in history to top the $1 billion mark in worldwide boxoffice sales. Starred Elijah Wood, Sean Astin, Viggo Mortensen, Ian McKellen, Orlando Bloom, John Rhys-Davies, Liv Tyler. Directed by Peter Jackson. Clint Eastwood's 25th film as a director was an amazing success story ... nobody wanted to make the movie, they rushed it into release for 2004 when they realized what kind of masterpiece they had, and the film took the ultimate prize on Oscar Night. Hailed by a huge number of critics as not only the best film of the year, but also Eastwood's greatest achievement, it was the simple yet powerful story of a crusty old boxing trainer (played by Eastwood) who eventually is convinced to take on his first female boxer to train, Maggie Fitzgerald (played by Hilary Swank). The story is much more than just another boxing movie, as it becomes an overwhelming drama of difficult decisions, filled with perhaps Eastwood's best performance as an actor, and a moving, touching performance by Swank in the film's final act. It's a reminder that sometimes some of the best "Best Picture" winning epics can be epics on a human scale, and this film was such a perfect example of simple humanity and the paths we lead in this life. The film was nominated for 7 total Oscars, and won 4. Starred Clint Eastwood, Hilary Swank, Morgan Freeman, Jay Baruchel, Mike Colter, Lucia Rijker. Directed by Clint Eastwood. In what will go down as perhaps the biggest surprise Best Picture upset over a sure thing that we've seen at the Oscars, Paul Haggis, who had written the 2004 Best Picture, came back to write and direct this new movie, and saw another film of his take the Best Picture prize. Filled with an all star cast, the film provided a broad canvas of characters, in telling the deeply moving and deeply troubling story of a variety of people living and every so often "crashing" into each other in contemporary Los Angeles. The drama examines racism and prejudice from all sides, realizing that every one of us probably has a little of these traits in ourselves, and presents us with a challenging portrait of humanity to see if perhaps one day, we can change. The film was nominated for 6 total Oscars, and won 3. Starred Matt Dillon, Sandra Bullock, Don Cheadle, Jennifer Esposito, Thandie Newton, Brendan Fraser, Terrence Howard, Chris "Ludacris" Bridges. Directed by Paul Haggis. A return to form for one of the greatest directors of all time, as he returned to the mean streets that he knows so well for a gritty and violent story about the cat and mouse game between the mob and the police, and their two informants, planted as moles in both groups. Set in contemporary Boston, the film detailed an intricate story as each mole tries to get the goods on the other before they are discovered. With lives on the line and the tension always fierce, it was a fascinating new addition to the gangster film genre, and finally brought the much coveted and much overdue Best Director Oscar to Martin Scorsese. The film was nominated for 5 total Oscars, and won 4. Starred Leonardo DiCaprio, Matt Damon, Jack Nicholson, Mark Wahlberg, Alec Baldwin, Martin Sheen, Vera Farmiga. Directed by Martin Scorsese. A lone man happens upon a bag full of money left behind in a drug deal gone wrong. He takes the money, only to find himself pursued not only by the law, but by the crazed psychopath who will stop at nothing to get his money. The Coen Brothers, always known for their offbeat and refreshingly original films, adapted a novel for the first time, and created an Oscar winning masterpiece, expanding a simple chase premise into stark and powerful character studies, particularly Javier Bardem's Oscar winning portrayal of one of the most magnetic and haunting villains in screen history. With much to say on the loss of morality and a world gone out of control, it was a dark yet fascinating addition to the continuing bold choices of the Academy for their year's Best Picture in more recent years. The film was nominated for 8 total Oscars, and won 4. Starred Josh Brolin, Javier Bardem, Tommy Lee Jones, Kelly Macdonald, Woody Harrelson. Directed by Joel Coen & Ethan Coen. It was a true story as improbable and inspiring as the story the film itself told. A film that was a struggle to get made, was almost lost by its distributor and shuttled straight to DVD, finally found a way to theaters, found an audience of enthusiastic fans, and found its way to the lofty heights of the Best Picture Academy Award. After more recent dark choices by the Academy, they embraced a film that tempered its darker and violent moments with an inspiring fable of true love. Beautifully structured in its writing, it recounts the life of a young man born into poverty in India as he has to prove why he is able to answer all the questions correctly on India's version of the game show "Who Wants To Be A Millionaire." As the story progressed, we slowly learned his true reason for going on the show, woven amongst a tapestry of life in Mumbai ... capped by a Bollywood style musical number to a song that also won an Oscar ... it all combined to make this absolute gem irrestible for audiences and the Academy alike. The film was nominated for 10 total Oscars, and won 8. Starred Dev Patel, Freida Pinto, Anil Kapoor, Saurabh Shukla, Madhur Mittal. Directed by Danny Boyle. The war in Iraq, which was still raging at the time of this movie's release, had been tackled by a diverse array of filmmakers with varying points of view trying to get a grip on one of the most controversial wars in America's history. In many ways, evoking the feeling of a film called Platoon which won Best Picture in 1986 for portraying the Vietnam War from the soldier's point of view, this film did pretty much the same for the Iraq War. It is a fictionalized account of one squad's experiences in the war defusing bombs, and in particular, one soldier's story of how the experience of war affects his ability to cope with life. Filled with unbelievable tension, and assembled by an incredible director, Kathryn Bigelow, utilizing all the best elements of cinema through picture, sound, editing, and music, it was praised by many as saying it was the first non-political film about the Iraq War experience. When it's precisely the opposite ... by showing the raw effects of war on the human psyche, it gives us the most basic and most powerful message about war that everyone should heed, particularly those in power ... how dehumanizing war essentially is. In this way, it's a film that continues a proud tradition of Oscar winning Best Pictures that traces back to the very beginnings when World War I was examined in the third Best Picture ever honored. Glad to see it's a tradition powerfully upheld ... but also sad to see that we still need these kinds of movies after all these years and all these wars. Starred Jeremy Renner, Anthony Mackie, Brian Geraghty, Guy Pearce, Ralph Fiennes, David Morse, Evangeline Lilly. Directed by Kathryn Bigelow. The inspiring true story of King George VI of Britain, who had to overcome a speech impediment to eventually help inspire the nation during the lead up to World War II. A lot of history was only recently discovered that enlightened the story of the relationship between the King (Bertie) and the speech therapist, Lionel Logue, who helped him overcome his stammer. Almost from the beginning, this film was deemed to have every quality that an Oscar winning Best Picture has, and it confirmed that prognostication on Oscar Night. Starred Colin Firth, Geoffrey Rush, Helena Bonham Carter, Derek Jacobi, Robert Portal, Michael Gambon, Guy Pearce, Timothy Spall, Jennifer Ehle. Directed by Tom Hooper. It certainly has to go down as one of the boldest and unique film experiments ever, a film in 2011 which told a story of the golden days of early Hollywood, but presented in black and white, and as a silent film. The result was the delightful story of a huge film star at the peak of his stardom facing a downward spiral when he no longer can feel at home in movies as the advent of sound in the late 1920's dawns. When a beautiful young new star comes on the scene, she becomes his savior in a dramatic and funny story of finding your way back again and the power of a love to save. It became the first movie made about movies to win the Best Picture Oscar, and became the only silent film to win the top honor ever since that very first Best Picture winner, Wings. Starred Jean Dujardin, Bérénice Bejo, John Goodman, James Cromwell, Penelope Ann Miller. Directed by Michel Hazanavicius. It was a remarkable true story that had only recently been declassified, but was the perfect subject matter for a thrilling historical drama. Ben Affleck skillfully orchestrated a successful comeback, this time as a director with two films previous to this, and this film would bring him his largest honors yet. During the Iranian hostage crisis in 1979-1980, an unknown story later emerged that six Americans managed to escape the takeover of the US Embassy, and the CIA eventually came up with a plan to rescue them before they become symbols and killed by the Iranians. They decided to invent a fake movie, and fly a CIA representative in to pretend the six were a film crew. Affleck and his crew so skillfully balance the crazy world of Hollywood where they put everything together to believably put together a film production, and the real danger that existed for these six Americans. In what was universally regarded as a truly great year for movies, from a film awards season which was all over the map, Affleck's film was finally too good to resist for the Academy to choose as their Best Picture. Starred Ben Affleck, Bryan Cranston, Alan Arkin, John Goodman, Victor Garber, Tate Donovan, Clea Duvall. Directed by Ben Affleck. It was an immensely powerful true story that was almost completely lost to history, until many brave filmmakers came together to bring the story of Solomon Northup to light in a film which ended up highlighting slavery in the United States in a way that really had never been done, and so much so, that it was decided that the film would start to be shown and taught in high schools. By focusing on Solomon Northup, a free black man who was kidnapped and sold into slavery, where he would suffer and endure for 12 long years before being rescued and returned to freedom, the film provided the viewer with a unique perspective of seeing the evils of slavery up close and personal, in brutal scenes that sometimes went on for minutes at a time, where we are unable to look away. Through stunning performances and skillful direction, it finally provided a stunning visual portrait of a past that we should never forget, as well as providing a powerful testament to the power and will of the human spirit. Starred Chiwetel Ejiofor, Michael Fassbender, Lupita Nyong'o, Sarah Paulson, Paul Giamatti, Benedict Cumberbatch, Paul Dano, Brad Pitt, Alfre Woodard. Directed by Steve McQueen. At its core, it was a story about a former movie actor who once headlined the very successful Birdman superhero franchise, who then walked away from it to only see his career and life fall down around him. Now, he's putting together a Raymond Carver play on Broadway to try to regain his career ... and himself. It was filmed in a completely revolutionary way, all shot to look like the entire movie was one long take, with an improvised drum score that brought us into the mind of Riggan Thomson. With a superb supporting cast, it managed to convey the frenetic energy of putting on a troubled Broadway production, as well as delving into the messed up lives of each of the characters. It has so much to say about the state of the film industry today, the very human need to remain relevant and important and was done in a uniquely cinematic way that will no doubt be studied years from now. Starred Michael Keaton, Edward Norton, Emma Stone, Zach Galifianakis, Naomi Watts, Andrea Riseborough, Amy Ryan. Directed by Alejandro G. Iñárritu. In a year of films which could be considered throwbacks to styles from the past, the Best Picture winner was another throwback in both style and substance, as it showed a group of journalists working a story to discover it encompassed a tragedy far larger than what they began with. It tells the true story of how the Boston Globe first uncovered incidents of Catholic priests who had molested children, and how that investigation grew to discover the nightmare that these incidents were occurring in far more places than just Boston, and that the local Catholic archdiocese and their associated lawyers and even people in the city had covered up these crimes. It presents a dispassionate look at an issue that already has a powerful emotional resonance, allowing us to see how people committed to uncovering the truth and not accepting the system as it is can take the brave steps to hopefully change things for the better. Starred Michael Keaton, Mark Ruffalo, Rachel McAdams, Liev Schreiber, John Slattery, Brian d'Arcy James, Stanley Tucci, Billy Crudup. Directed by Tom McCarthy. It was the year of the biggest Oscar snafu in history, when the wrong Best Picture winner was announced and this film was finally revealed as the winner. That unfortunately took away from the truly landmark selection this was, the first LGBTQ film to ever win the Academy's Best Picture prize. In its telling of a powerful story chronicling the childhood, adolescence and burgeoning adulthood of a young African-American gay man growing up in a rough neighborhood of Miami, it broke so many filmmaking conventions while being filled with gorgeous cinematography, soaring original music, and performances of the caliber that should always be a hallmark of any Best Picture Oscar winner. Starred Mahershala Ali, Ashton Sanders, Janelle Monae, Naomie Harris, Alex R. Hibbert, Jaden Piner. Directed by Barry Jenkins. In an age where the ideas about love have been antiquated, Guillermo Del Toro created a throwback fantasy monster type movie to tell a beautiful fable about the mysteries of love. Set in the 1960's, it tells the story of a lonely mute janitor who finds a connection with a mysterious amphibious creature who has been brought in to a top secret research facility. In their struggle to be together and keep the creature from being destroyed by those who only see something evil, the movie becomes a thriller, and a surprisingly beautiful romance unlike anything we'd really ever seen. Starred Sally Hawkins, Michael Shannon, Richard Jenkins, Octavia Spencer, Michael Stuhlbarg, Doug Jones. Directed by Guillermo Del Toro. Starred Viggo Mortensen, Mahershala Ali, Linda Cardellini, Sebastian Maniscalco, Dimiter D. Marinov. Directed by Peter Farrelly.